The luxurious Ferryview Country Home is located on Ireland's famous Ring of Kerry. Cahersiveen can actually be spelt in three different ways. Google Maps spells it "Caherciveen" and the phonebook uses "Cahirciveen". Most signposts in the area use the phonetical spelling "Cahersiveen". Throughout this website we will use a mixture of all the words to ensure that the majority of people are catered for. We are a family run Caherciveen Bed and Breakfast with a unique blend of comfort and Irish country charm. 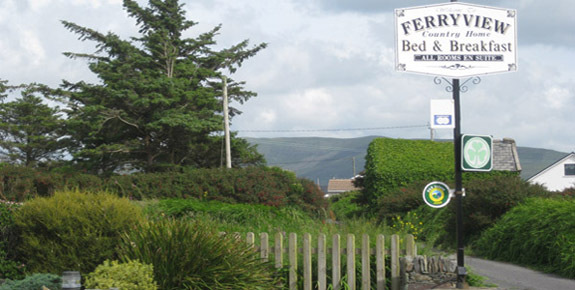 Situated at the foot of Kerry's Beentee mountains, all of our rooms have an ocean view. In the USA people refer to "Bed and Breakfasts" as "Inns" so in this case we are a luxury inn. All rooms in the B&B have their own bathroom complete with shower and toilet. The Master Bathroom has both a shower and a Jacuzzi Bath which you can enjoy after a hard day visiting all the attractions the area has to offer. This is an ideal accommodation for your boat trips to the skelligs. We will arrange a Skellig boat tour for you. Please contact us in advance if you wish to go to the Skelligs as sometimes it can be very busy. Pickup from the B&B to the Skellig tours departure point provided to those without cars free of charge and of course we will return you back to the accommodation again in the evening. Enjoy the spectacular Atlantic scenery overlooking the beautiful Valentia Harbour with views of the wide estuary of the river Fertha and the Carhan river, the magnificent undulating hills on Valentia Island, the sandy shores of Beginnis Island, the monastic site on Church Island and Dingle Bay. When in County Kerry you can relax in a casual atmosphere of our country home. Your hosts Jim and Mary Guirey will ensure a warm welcome with a cup of tea and home made scones on arrival. 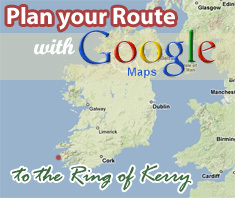 Jim and Mary can also offer local information on Ring of Kerry Tours, and various outdoor activities. For reservations please call +353 (0)66 9472052, email us on info@ferryview.com or alternatively fill out the online enquiry form below.